Long before she was a writer, Laura Ingalls Wilder was a gardener and farmer, growing food for the table and raising crops for sale. In the beautifully crafted articles shared with us by Marta McDowell, she depicts Laura Ingalls Wilder as not just an American children’s author, but as a nature writer as well. “When you think of “Little House on the Prairie,” you may think of the covered wagon journey, Jack the brindle Bulldog’s loss and return, log cabin construction or fever ‘n’ ague. I think about potatoes,” she explains. 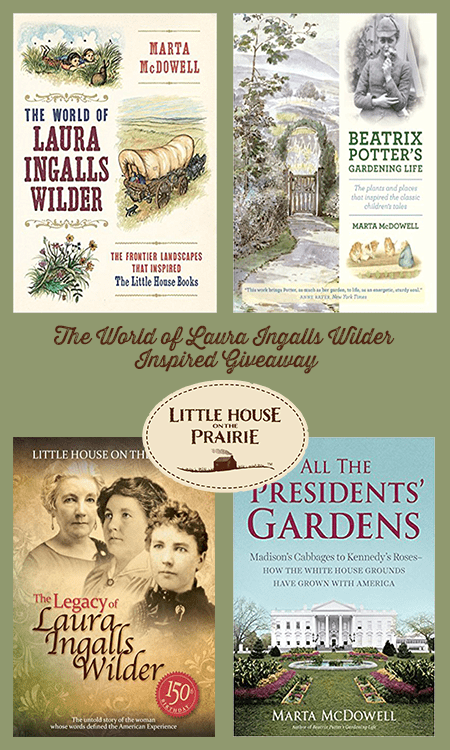 In this special giveaway from September 4 through 25, you will have the opportunity to win one of SIX (6) Giveaway Prize Packages comprised of autographed copies of Marta McDowell’s wonderful books published by Timber Press and of a DVD of “The Legacy of Laura Ingalls Wilder” documentary. One of 6 autographed copies of The World of Laura Ingalls Wilder by Marta McDowell. The World of Laura Ingalls Wilder, by author Marta McDowell, explores Wilder’s deep relationship with the landscape. Follow the Wilder’s wagon trail starting in the Wisconsin setting of Little House in the Big Woods, through the Dakotas, and finally to Missouri. One of 6 autographed copies of All the Presidents’ Gardens by Marta McDowell. In All the Presidents’ Gardens author, Marta McDowell tells the untold history of the White House Grounds with historical and contemporary photographs, vintage seeds catalogs, and rare glimpses into Presidential pastimes. One of 6 autographed copies of Beatrix Potter’s Gardening Life by Marta McDowell. One of 6 DVDs of the “The Legacy of Laura Ingalls Wilder” documentary. “Little House on the Prairie: The Legacy of Laura Ingalls Wilder” is a one-hour documentary that goes beyond the famed Little House book series to the behind-the-scenes, true life story of one of America’s most iconic authors, Laura Ingalls Wilder. Her adventures come to life through passages from the Little House books, interviews with Wilder scholars and historians, archival photography, paintings from famous frontier artists, dramatic reenactments, a beautiful original score and original illustrations. U.S. residents, 18 years of age and older, can log into the Rafflecopter giveaway widget below. Use your Facebook account or name and email so your entries count. The first entry is the newsletter sign up – confirm your subscription to unlock the other, optional entry methods. The giveaway will run from September 4 to 25, 2017. Winners will be contacted via email once their entry authenticity is confirmed. Hello I grew up reading about pioneer life with Laura Ingalls and other authors. My kids and now my grandkids and great grandkids are enjoying these wonderful stories and tv programs. I would like to see your contests available to Canadians. Books keep the mind open to enjoyment, Would love to read these new books. One can only admire their faith and dedication to family! I have always loved Little House books and even have the cookbook. I would love to read the new books, especially the one about Mama Caroline Ingalls. When I was in grade school in Iowa many years ago, my second grade teacher read aloud several “Little House on the Prairie” books a chapter at a time. That’s when I first became delighted by Laura and the pioneer life of the Ingalls Family. If we could just go back to the principles that were in the stories that she wrote; what a better world this would be. My children watched the show when they were small and enjoyed them very much. Still do.